This ornamental fig, with its distinctive, spiral stem makes a striking houseplant. Easy to care for, it's at its happiest when left alone. Luxurious, glossy-green leaves held in a lollipop shape gently weep as it grows. A must-have plant for adding exotic interest to your home - and great for Instagram sharing! Supplied as a plant with a single twisted stem in a 20cm pot. 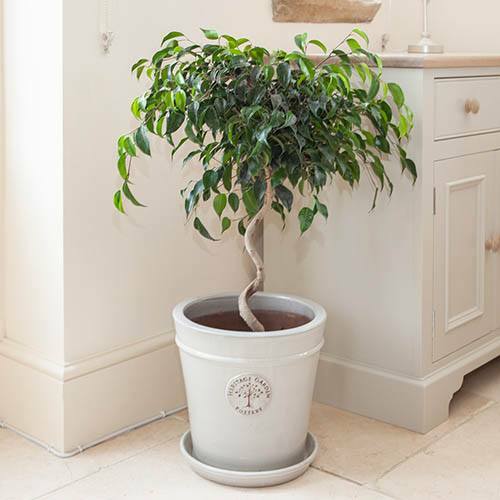 The exotic Ornamental Fig, Ficus benjamina is a houseplant that's currently bang on trend and on everyone's wish list. With a beautiful spiral, twisted stem, this variety, ‘Danielle’, adds a distinctive, tropical feel to your home. The trunk of the plant has been formed into a stunning spiral shape as the tree has grown, making it a great ornamental feature plant, and it won’t straighten over time so will keep its original shape. The glossy, rich green leaves of 'Daniella' are held on top of the trunk in a globe, and over time, the slender branches will begin to weep, softening the plant and making a definite talking point. Not just a pretty face, Ficus is well known for helping keep the air in your home clean as it filters out pollutants keeping it fresh and clean - according to NASA, weeping figs fight formaldehyde, xylene, and toluene, found in furniture, fireplace smoke, and common household products. Very easy to care for, once you have found the perfect place for your spiral fig, you can more or less leave it alone and let it do its 'thing' as long as it's kept out of drafts. Supplied as a mature plant on a single spiral stem in a 20cm pot. Height approx 1m including pot. Supplied as a mature plant on a single spiral stem in a 20cm pot. Height 1m approx. including pot. Once it has found the right place, don't move your fig around as they dislike disturbance. Find a bright spot away from direct sunlight, not close to a radiator or other heat source, and away from draughts. Water with tepid water when the soil is just starting to dry out on the surface, but don't let it dry out completely - during the winter you can reduce watering. Mist the leaves in the summer months, and feed with a liquid fertiliser during the growing season. If your Ficus benjamina begins to lose its leaves it may be too dry or in a draught. Plunge the post into a bucket of water for an hour to let it soak and then move in front of a light window.